So all this exercise and watching what I eat is having an effect. How could it not, in all truth? I’ve been burning more calories than I’ve been consuming, every day, well nearly every day, for two months. The result of all this effort, a loss of 10.5kg, excellent. Now all I need to do is keep the pressure on, and before I know it, I’ll have reached my goal. Then all I have to do is to stay there. It all sounds rather familiar doesn’t it? Very much like the constant effort to change my life through my Buddhist practice. When you start changing things through practice, your life-state, your life-energy, you may well encounter a reaction. Every action has an opposite reaction and they can be totally unexpected in nature. As we try to improve ourselves, we change the way we react with the world. Sometimes the world isn’t quite ready for that change and it can make for uncomfortable situations. Just remember to add a little compassion and wisdom into the mix too, and the odd multivit won’t hurt either. A parcel arrived in the post this morning, the contents of which will offer someone a little inspiration every day. In the parcel was a copy of Daisaku Ikeda’s Buddhism Day by Day. Like a diary, it offers a different thought provoking passage for every day of the year. Although it is primarily a compilation of Sensei’s thoughts, with an obvious Buddhist slant, I believe it would be an inspiration for anyone, irrespective of their religion or beliefs. I think a little snippet of Sensei’s wisdom, each morning, would set us all up for the day. Buddhist Practice is rather like a dog, for life, and not just for Christmas, and must be part of your very being. Now I’m not suggesting that I have been back sliding, because I haven’t, but I know there is still more I can do towards achieving my goal. The difficulty is getting the balance right, treading a fine line between strenuous regular practice and learning, and forming an obsession with the new way of life. Given the fact that the whole point of adopting Buddhism as a way of life is to gain a happier existence for me and those around me, I need to get this right. Those of you who know me, know that I have an addictive nature and throw myself into new ventures wholeheartedly. The problem, in the past, has been keeping that going. I have been, I admit openly, in the World of Hunger, for most of my life, always looking for the next new thing. I am certain that I am managing that and have already made some headway, but self criticism is healthy in this respect. One reason for keeping this blog, and we’re past the 1000 post mark now, is to prove to myself that I have changed, and that I have the drive and desire to keep my practice strong. You have my permission to tell me, if you see any cracks appearing. Living on the coast, it can get very foggy at times, to the point where you can’t see your hand in front of your face. The fog horn blares out all night, you can’t sleep, and your surroundings take on a surreal air. An afternoon of tranquillity, surrounded by the beauty of nature is good for calming the mind and lifting the life-state. 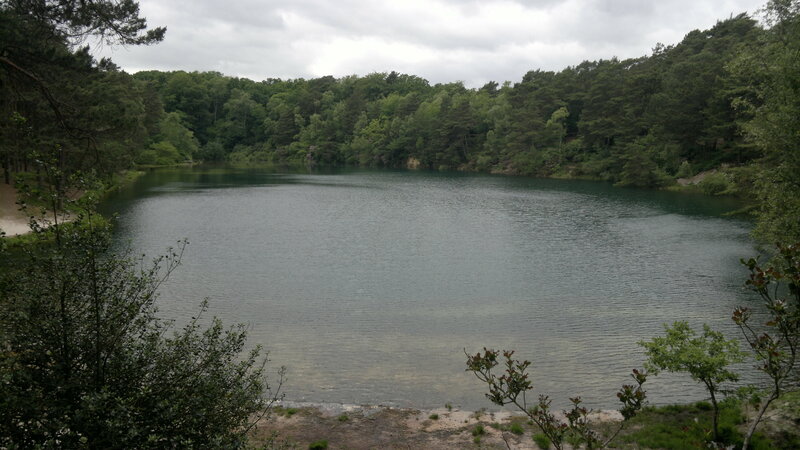 The Blue Pool, near Wareham in Dorset, is a disused clay pit which has been transformed since the time of Elizabeth The First, into a magical place of woods and water, sights and sounds. The pit provided the clay for many things over the years, but there is an interesting collection of clay pipes in the small museum adjoining the tea rooms. The Pool constantly varies in colour. Very fine clay in suspension in the water diffracts light in different ways, producing a spectrum of colour sometimes green sometimes turquoise. The air is full of the scent of pine and the sounds of the local wildlife. Set in a deep clay bowl, steps lead down to the waters edge or up to views of the Purbecks. The Pool is surrounded by heath and gorse with sandy paths that take you to another world. 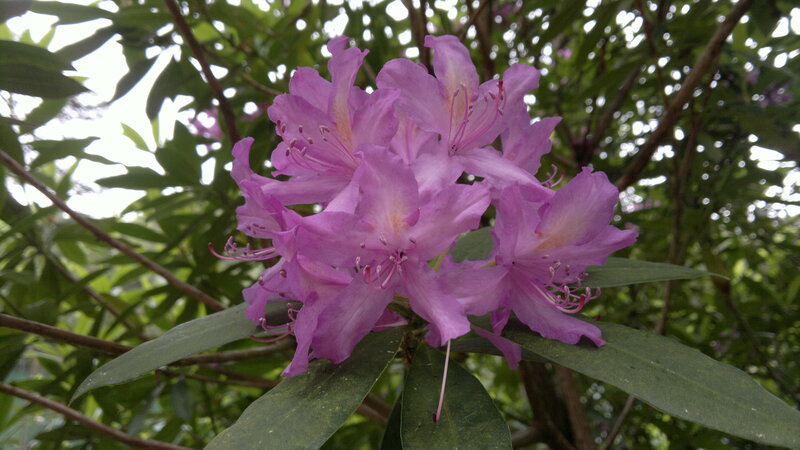 The pines are interspersed with beautiful rhododendrons, which were looking their best after the recent rains. A wonderful way to spend the afternoon, and a quiet topic for my one thousandth blog post. Whoever said that life was supposed to be a bowl of cherries? Our journey from birth to death, whichever lap we happen to be on at any one time, is a series of lows and highs, the rough and the smooth, the not-so-happy and the happy, the bad and the good. So by assuming that, even though things may be going along smoothly just now, we should prepare ourselves for the next pot hole, the unexpected hairpin or that most untimely puncture that will most certainly come along, to make that journey even more satisfying. Being prepared, as all boy scouts know, is the trick to reducing the effect that these unforeseen circumstances will have on our progress. Those of you who know me personally will be aware that I am on a bit of a quest to lose some excess weight and get my poor old body back into shape. The same people will also know that I can get a bit addicted to challenges like this, with charts and spread sheets and training plans, the full Monty. I find it easier to focus on a goal when I know the details of exactly what is required to achieve it, so I decided to do a little maths to work out where I am along this path to a slimmer me. There are roughly 6618 kcal in each kg of body fat. Assuming that all the weight I want to lose is body fat, that’s another 106,500 kcals I have to burn, over and above that my body uses just to function. Now I am currently burning around 35 kcal per kilometre, whilst cycling, which means that I will have to cycle another 2960 kilometres (at least) to reach my goal. That’s Land’s End to John O’Groats and back or there about, which is enough to focus anyone’s mind on the task. So where’s the Buddhism in all this? Well it’s about self-improvement and self-awareness, it needs determination and a degree of courage, tempered by a great deal of acquired wisdom, so as not to injure or make myself ill in the process. It’s also about the level of focus needed. Being aware, every waking minute of every day, of the effects of all your actions, be that eating, walking, drinking, sitting, cycling, you name it. For every cause, there is an effect, so when the desired effect is known, it is all about making more causes to foster that effect than those that deter the effect from happening. So far so good, and interesting how well Nam Myoho Renge Kyo fits my breathing pattern when I’m head down, pressing on.